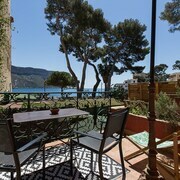 Situated near the beach, this hotel is within a 10-minute walk of Cassis Harbour and Cassis Beach. Calanques National Park is 1.1 mi (1.8 km) away. Situated in Cassis, this hotel is steps from Cassis Harbour and Cassis Beach. Calanques National Park is 0.7 mi (1.2 km) away. Situated in Cassis, this hotel is within a 15-minute walk of Cassis Harbour and Cassis Beach. Calanques National Park is 0.7 mi (1.1 km) away. 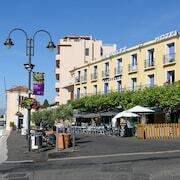 Situated in Cassis, this hotel is within a 10-minute walk of Cassis Harbour and Cassis Beach. Calanques National Park is 0.7 mi (1.2 km) away. Located in the heart of Cassis, this hotel is steps from Cassis Harbour and Cassis Beach. Calanques National Park is 0.8 mi (1.2 km) away. Situated in Cassis, this hotel is within a 5-minute walk of Cassis Harbour and Cassis Beach. Calanques National Park is 0.6 mi (1 km) away. The property was very unique. 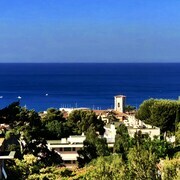 It sits on the banks of the Mediterranean Sea facing the town of Cassis. 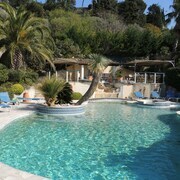 The grounds are magnificent with two pools on the edge of the sea. 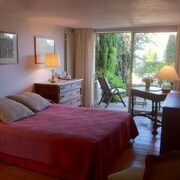 The rooms are very comfortable with new bathrooms. The food at the restaurant is fabulous and very French. Most of all, the staff is so delightful and friendly. We did not want to leave! Juste un souci d’eclairage Dans la chambre pas de moyen pour éteindre la lumière depuis lit et même problème pour la SDB Pas d’eclairage Sur la terrasse côté cours ! Where to find Cassis hotels near an airport? How can I find hotels in different Cassis neighborhoods? Where can I find hotels in Cassis that are near tourist attractions? When planning your Marseille vacation, you can rest assured because you will find a wide selection of great hotel options in Cassis. Expedia's booking page currently contains 25 places to base yourself within a 0.1-kilometre (0.06-mile) distance of downtown Cassis. An essential ingredient to hassle-free traveling is finding a convenient location to base yourself, so why not check out the latest offers at the Royal Cottage and INTER-HOTEL Cassitel, which you'll find a short distance of Cassis' heart. You could investigate the Hostellerie La Farandole and the Hôtel et Spa du Castellet. 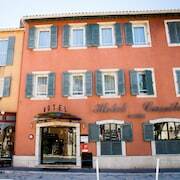 The Hostellerie La Farandole is 20 kilometres (13 miles) from the center of Cassis. The Hôtel et Spa du Castellet, is positioned 20 kilometres (12 miles) away. You could also choose to make a reservation at the Hôtel Île Rousse or the Le Petit Nice Passedat. Why don't you spread your wings and discover the many other attractions of Provence - Alpes - Cote d'Azur while you are here? Spend time at Provence - Alpes - Cote d'Azur's ruins, traditional villages and old towns. Those who love the great outdoors can also take the time to enjoy its rural landscapes, beaches, mountains and gorges. Common pastimes in this part of France include picnicking and sunbathing. Looking for more things to do? Why not spend a few hours exploring Santons Maryse Di Landro Museum and Marcel Pagnol House, in Aubagne, 9 kilometres (6 miles) to the north of Cassis. 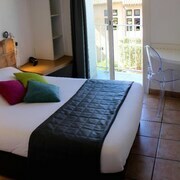 The INTER-HOTEL Souleia and Odalys Résidence Debussy are just some of the long and short-stay options in Aubagne. Or, you could consider staying in Quartier du Panier, 17 kilometres (11 miles) to the northwest of Cassis, where you'll find the InterContinental Marseille - Hotel Dieu and Sofitel Marseille Vieux Port. The Museum of Old Marseille and Fort St-Jean are just a couple of the more popular points of interest to explore for those visiting Quartier du Panier. Marseille - Provence Airport can be found 35 kilometres (23 miles) from Cassis. Should you wish to stay close by, can easily book a room at the Pullman Marseille Provence Aéroport or Best Western Marseille Aeroport. What are the most popular Cassis hotels? "At the Heart of Cassis"
Are there hotels in other cities near Cassis? What other types of accommodations are available in Cassis? Explore Cassis with Expedia.ca’s Travel Guides to find the best flights, cars, holiday packages and more!